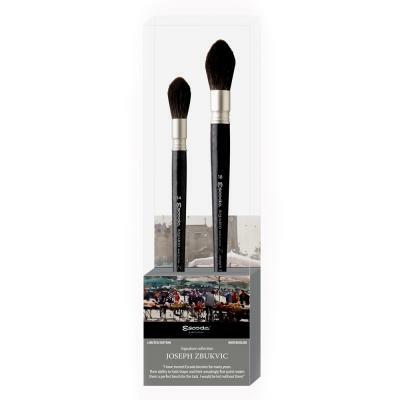 "I have trusted Escoda brushes for many years. Their ability to hold shape and their amazingly fine point makes them a perfect brush for the task. I would be lost without them." Joseph Zbukvic is a leading master of his time in watercolour painting and techniques. His impressive achievments and enormous success are due to his ability to transform any subject into visual poetic language. Covering an inginite variety of subjects, his sensitive, lyrical and atmospheric paintings have captured people and galleries from all around the world. This set contains two round Escoda Aquario "Mop" brushes, size 14 and 18 and are made with squirrel hair. The brushes were developed and created following strict instructions by Zbukvic himself and are intended for use on larger pieces of work. It is a Limited Edition set due to the scarcity of squirrel hair. Super soft squirrel that holds lots of liquid and comes to a fine point when needed. Well made and nicely finished. I particularly like the parallel ferrule with its matt finish and triple-crimping to the handle. Fine brushes with great control. You'll love them if you like to work with mops. They are slightly different than Isabey mops which I am used to. With these you get more precision due to the hair which have more spring compared to Isabey.